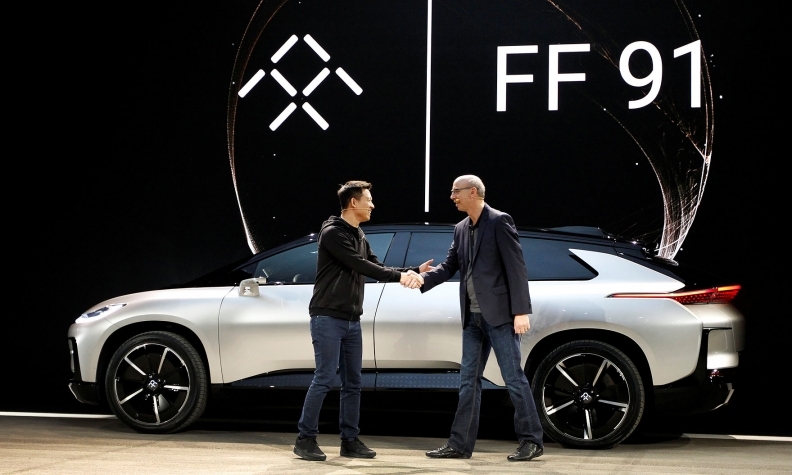 Jia Yueting, left, founder and CEO of LeEco, with Nick Sampson, senior vice president of product r&d and engineering at Faraday Future, with the FF 91 at CES on Jan. 3, 2017. Electric vehicle maker Faraday Future is planning to raise $1 billion as it seeks to protect itself from the financial woes of its main backer, China's LeEco, a person with direct knowledge of the matter said. The startup has begun meeting potential investors and is in the process of selecting advisers, said the person, who asked not to be identified because the details are private. LeEco, controlled by Jia Yueting, is suffering from a cash crunch after expanding too fast and building businesses spanning electric vehicles, smartphones, car-hailing, TVs and a Netflix-like video service. The billionaire recently stepped back from his flagship streaming service as his empire struggles with fundraising difficulties and unpaid bills. Jia, who has invested over $300 million of his own money in Faraday, will not be putting up any more capital, the person said. The company is targeting large scale investors such as sovereign wealth funds and hopes to complete the funding in the next couple of months, according to the person. Faraday didn't immediately respond to a request for comment made outside normal business hours. Faraday's progress has been mixed. In January, the startup revealed what it said was the world's fastest electric car, showing footage of its 1,050-horsepower FF 91 outracing Tesla Inc.'s Model S during a showpiece event in Las Vegas. Meanwhile, construction of the plant has been affected with a key contractor requesting additional payments. The company has reportedly scrapped plans for a California auto plant to focus on building its main factory in northern Las Vegas. Senior executives this week reassured staff that the cuts affecting LeEco's U.S. staff would not affect Faraday's growth.